As I got rid my nearly 10 years old Wacom graphic tablet, this little thing really surprises me. First of all, it is so nice and sleek tablet which is comparable to Wacom pen tablets. 1> Instruction and spare nibs are inside the white box which holds the pen and cable. Please check them out first in case you may miss them. 2> Please follow the instruction and connect the tablet first, then install their driver. 3> The indication light is located at up left corner on tablet. It will blink when connected. 1> There are four little dots on tablet which indicate the working area. Besides, when you put your hand on the surface of tablet and apply a little pressure, you may notice that there seems to be some thin air underneath the tablet surface. Please don’t freak out. It doesn’t affect anything at all. 2> The surface of tablet is sleek and smooth. It won’t feel like drawing on paper. Personally I prefer smooth feeling for a tablet. 3> The pressure performance is awesome! While the nib can bounce a tiny bit, it delivers my hand movement and pressure change exquisitely and precisely. This is the major reason why I claim that this tablet can compete with Wacom tablet. I have used Wacom Bamboo and Intous 4M before. 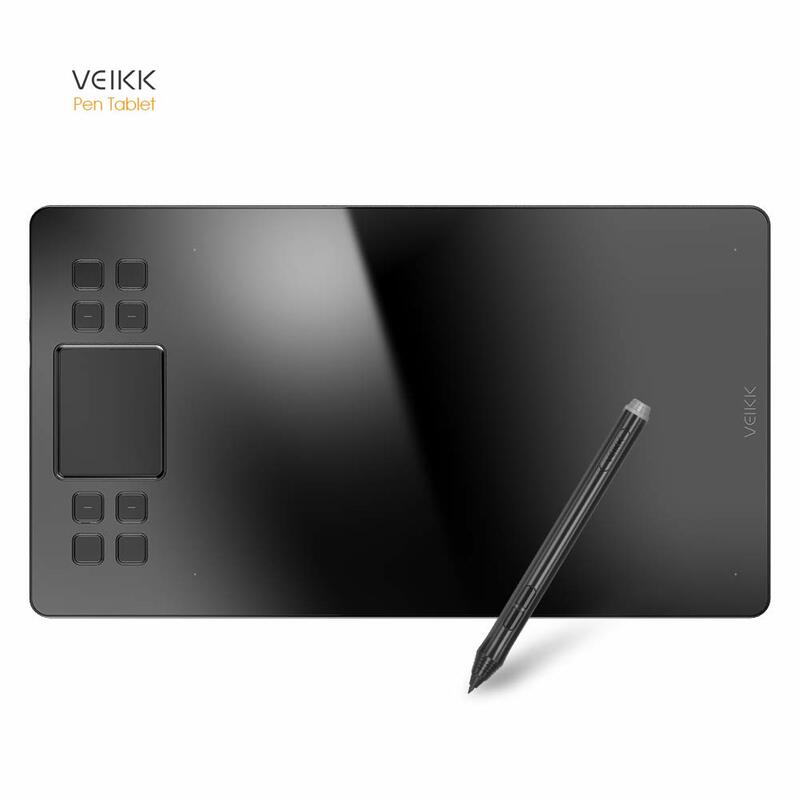 I couldn’t tell the difference between VEIKK and Wacom tablet. This is definitely worth the money if you don’t require tilt sensitivity. 4> As to the hot key buttons. They are convenient but I don’t really use them. Since the tablet is compact size, I can put my regular keyboard right next to it or behind it. I feel more comfortable in that way. 1> A pen holder would be better. When I need to take a break I always try to put the stylus pen into a pen holder. But in this case, I can only lay it down on my desk. But this is not a big deal since I can make one from foam block. 2> Rarely, I need to reconnect the USB cable to make the tablet work. 3> The size is compact but surely big enough for drawing. Easy to store and travel with. 4> Again, according to the pressure performance, this tablet is awesome. You can get the quality of Wacom tablet with fraction of money. Absolutely worth it! I gave this pen tablet away in my Etsy shop, in the future I hope I can do give away in my blog. I drew an antique brooch with this tablet. The reference photo of this brooch is from Drucker Antiques. Hope you would like it.